Those of you who were disappointed that the Galaxy Nexus missed its Prime moniker are in luck: it looks like the tablet formerly known as the Transformer 2 will get it instead. Asus has pot together a landing page for the “Eee Pad Transformer Prime”, thrilling Android tablet fans and children of the 80s together in one fell swoop. 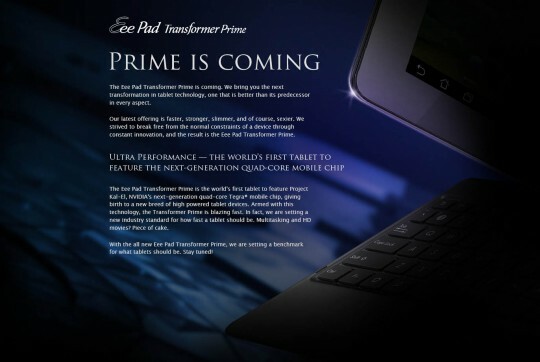 The page is quick to point out the tablet’s Nvidia Tegra 3 “Kal-El” quad-core processor and thin new design. The website doesn’t mention a release date ,but if you believe Asus’ Jonney Shih, they’ll be announcing the second-generation Transformer on November the 9th. Other confirmations that Mr. Shih was nice enough to divulge include a super-thin 8.3mm frame and a 10-inch screen, likely the same one as in the original. The signature keyboard dock looks a little different, which probably means it won’t be interchangeable with the previous generation. Pricing and availability are up in the air, but considering how successful the original Eee Pad Transformer was at $399, I can’t see Asus messing with it too much. One interesting thing I notice: have a gander at those navigation buttons on the screen. They don’t look anything like standard Honeycomb, but they don’t look exactly like the Ice Cream Sandwich navigation buttons either. That means one of two things: Asus has taken liberties with Honeycomb and done a little skinning, or those are the tablet versions of Ice Cream Sandwich’s nav buttons, reworked for a larger interface. Okay, maybe three things: it’s a production render and there’s no way to make any real judgement either way. But given how much Asus has been talking up Ice Cream Sandwich, it wouldn’t surprise me at all to see the Transformer Prime launch with Ice Cream Sandwich or get a quick upgrade. We wait with breathless anticipation for the official announcement, tentatively set for November 9th.